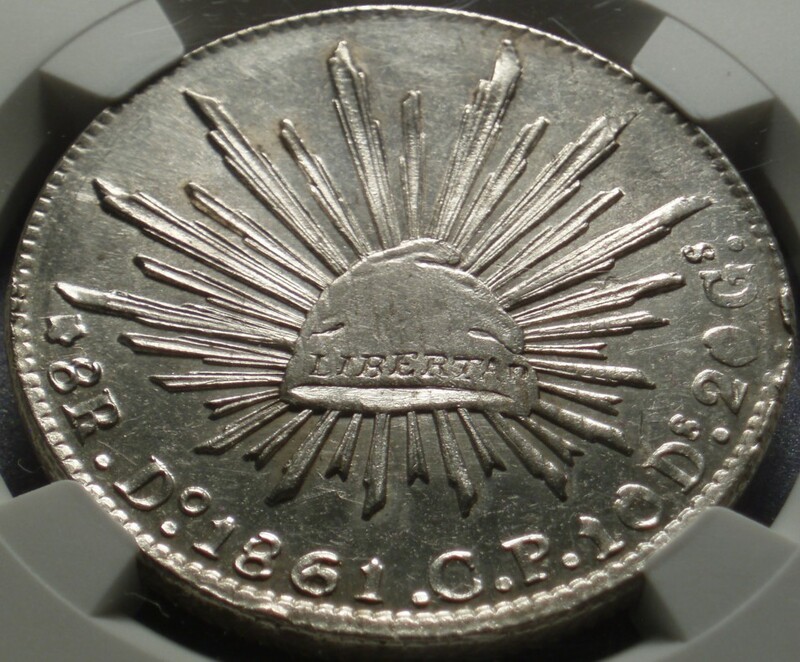 1861 Durango Mexico Silver "Eight Reales"
This is a beautiful, Brilliant Uncirculated, “Eight Reales” from Mexico. It was struck at the Durango Mint in 1861 during the Presidency of Benito Juárez. This was just before the French invaded and the short-lived “Empire of Maximilian” was set up. 27.70 Grams, 38 Millimeter, .903 Silver. Obverse: REPUBLICA MEXICANA • Eagle, with Snake in Beak, Standing on a Cactus. This, the national symbol of Mexico, stands for the Aztec legend that foretold they were to make a great empire in a marshy area where they would see a cactus with an eagle standing on it eating a snake. The site where this actually happened is now Mexico City. Reverse: 8R • Do • 1861 • C.P. • 10Ds 20 Gs • LIBERTAD • Liberty Cap on rays. The C. & P. are the initials of the mint assayers. Mexico used the medieval system of Dineros and Granos to measure the fineness of their coins, Twelve Dineros designating pure Silver, with each Dinero divided into 24 Granos. A coin of 10 Ds. 20 Gs equated to .902777 fine. Durango sits in the mountains of Mexico at an altitude of 6,168 feet above the sea. The mint was opened in 1811 under the Spanish. It produced coins until 1895 when it was finally closed. This one has been certified genuine and graded Mint State 61 by the prestigious Third Party Grading Service, “Numismatic Guaranty Corporation” (NGC). Note: Even though it has been professionally graded, that is just an opinion and grading is subjective, so please see the pictures and judge for yourself.